ISBN-13: 978-9401790871 ISBN-10: 9401790876 Edition: 2014 ed. The second volume in the collected works of Mihaly Csikszentmihalyi covers about thirty years of Csikszentmihalyi's work on three main and interconnected areas of study: attention, flow and positive psychology. Describing attention as psychic energy and in the footsteps of William James, Csikszentmihalyi explores the allocation of attention, the when and where and the amount of attention humans pay to tasks and the role of attention in creating 'experiences', or ordered patterns of information. Taking into account information processing theories and attempts at quantifying people's investment, the chapters deal with such topics as time budgets and the development and use of the Experience Sampling Method of collecting data on attention in everyday life. Following the chapters on attention and reflecting Csikszentmihalyi's branching out into sociology and anthropology, there are chapters on the topic of adult play and leisure and connected to that, on flow, a concept formulated and developed by Csikszentmihalyi. Flow has become a popular concept in business and management around the world and research on the concept continues to flourish. Finally, this volume contains articles that stem from Csikszentmihalyi's connection with Martin Seligman; they deal with concepts and theories, as well as with the development and short history, of the field and the "movement" of positive psychology. Start reading Flow and the Foundations of Positive Psychology on your Kindle in under a minute. 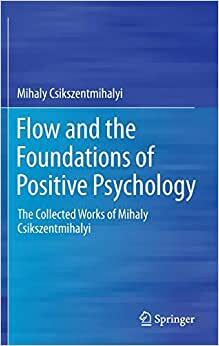 The second volume in the collected works of Mihaly Csikszentmihalyi covers about thirty years of Csikszentmihalyi‘s work on three main and interconnected areas of study: attention, flow and positive psychology. Describing attention as psychic energy, and in the footsteps of William James, Csikszentmihalyi explores the allocation of attention, the when and where and the amount of attention humans pay to tasks and the role of attention in creating ‘experiences’, or ordered patterns of information. Taking into account information processing theories and attempts at quantifying people’s investment, the chapters deal with such topics as time budgets, and the development and use of the Experience Sampling Method of collecting data on attention in everyday life. Following the chapters on attention, and reflecting Csikszentmihalyi’s branching out into sociology and anthropology, there are chapters on the topic of adult play and leisure, and connected to that, on flow, a concept formulated and developed by Csikszentmihalyi. Flow has become a popular concept in business and management around the world, and research on the concept continues to flourish. Finally, this volume contains articles that stem from Csikszentmihalyi’s connection with Martin Seligman; they deal with concepts and theories, as well as with the development and short history, of the field and the “movement” of positive psychology. A Hungarian psychology professor, who emigrated to the United States at the age of 22. Now at Claremont Graduate University, he is the former head of the department of psychology at the University of Chicago and of the department of sociology and anthropology at Lake Forest College. He is noted for both his work in the study of happiness and creativity and also for his notoriously difficult name, in terms of pronunciation for non-native speakers of the Hungarian language, but is best known as the architect of the notion of flow and for his years of research and writing on the topic. He is the author of many books and over 120 articles or book chapters. Martin Seligman, former president of the American Psychological Association, described Csikszentmihalyi as the world's leading researcher on positive psychology. Csikszentmihalyi once said "Repression is not the way to virtue. When people restrain themselves out of fear, their lives are by necessity diminished. Only through freely chosen discipline can life be enjoyed and still kept within the bounds of reason." His works are influential and are widely cited.